Home Cartoon Network Pokemon Black And White Season 14 Hindi Episodes New ! Pokemon Black And White Season 14 Hindi Episodes New ! Episode 2- Enter Iris and Axew! After the strange black cloud appears again, Pikachu's Electric moves are restored. Professor Juniper gives Ash a new Pokédex and Poké Balls so he can begin his journey in Unova. On his way, he comes across Iris and her Axew. 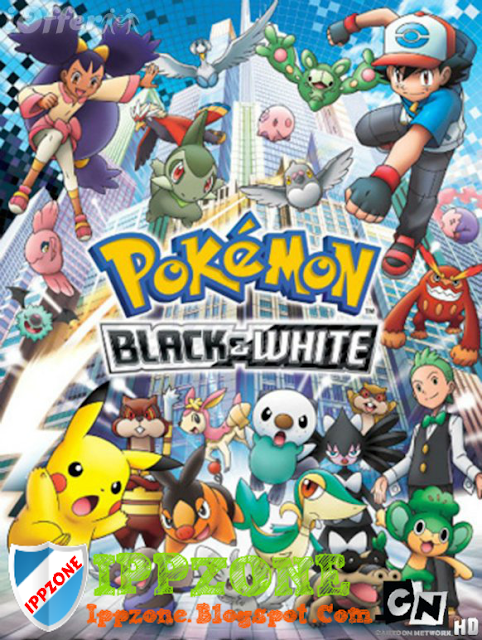 When Team Rocket appears and tries to steal Pikachu and Axew, Ash tries to use his newly-caught Pidove against Jessie and her new Woobat, though Pidove is overpowered; however, an Oshawott (the one from Juniper's lab) appears and saves Pikachu and Axew. Ash and Iris take Pokémon to a Pokémon Center, where Iris decides to travel with Ash and Pikachu through Unova, as she knows her way around the region. As the two head off, Oshawott watches from afar. While on their way to the first Gym, Ash and Iris realize that they are being followed by the Oshawott from Professor Juniper's lab. They find out it wants to be captured by Ash when he called it very cute. Juniper sends Ash Oshawott's Poké Ball, but Oshawott disappears before he can be recaptured. They soon come across a boy named Dan, whose father owns a resort with a sand spa that has been disrupted by a group of Sandile, led by one wearing sunglasses. After coming across Oshawott and Team Rocket again, Ash, Iris, and Dan discover that the Sandile were trying to get help for a group of Pidove, Deerling, and Patrat from a hot spring on the verge of flooding. When it floods and traps the other Pokémon on a small island, the Sandile form a bridge to save them, but Ash is trapped on the island when their grip fails. Oshawott manages to save them with a Water Gun, and Ash uses the opportunity to recapture Oshawott. With everyone saved and the sand spa turned into a hot spring, Ash and Iris relax as the sunglasses-wearing Sandile watches on. Ash and Iris finally reach Striaton City, where they meet Pokémon Connoisseur Cilan at the market. He sees that Pikachu and Ash are very compatible and he invites Ash and Iris to the Striaton Gym, only for Ash to be surprised that it is a restaurant instead. Chili and Cress introduce themselves, as well, and put on a show in the restaurant until Ash becomes angry that he was tricked. However, the three brothers reveal themselves as the Striaton Gym Leaders, showing him the Gym's battlefield. To their surprise, Ash decides to fight all three Gym Leaders for the Trio Badge. Tepig fights Chili's Pansear and wins. Pikachu goes up against Cress's Panpour, but loses. In the final match, Oshawott is sent in against Cilan's Pansage. Oshawott is able to hold his ground against the Grass Pokémon, until Cilan calls out for Pansage to use a Solarbeam. Continuing from Ash's battle at the Striaton Gym, Oshawott has managed to deflect Pansage's Solarbeam with his shell. Oshawott is able to use his Razor Shell move to defeat Pansage, earning Ash the Trio Badge (with Iris unimpressed.) Elsewhere, Team Rocket finds the Dreamyard and set up a device they are instructed to by Giovanni, which soon begins to disturb a sleeping Pokémon. After Cilan begins to ask about Ash's battle methods, and Ash sees a passing Audino at the Pokémon Center, Iris's Axew suddenly begins feeling ill and is glowing pink. A scientist named Fennel and her Munna arrive, Munna using its Dream Eater move to make Axew wake up and then its Dream Smoke to reveal its dreams. The group finds Striaton City is engulfed in Dream Smoke from a Musharna that Fennel used in her research. Ash, Iris, and Cilan accompany Officer Jenny and Fennel to the Dreamyard, finding that Team Rocket is causing trouble. Pikachu destroys the device they built, freeing Musharna. Back at the Striaton Gym, Cilan says his goodbyes to Chili and Cress, as he has decided to join Ash on his journey through Unova, as has Iris, as they head on out to the Nacrene City gym. While having lunch on the way to the next city, Cilan discovers that all the food he prepared has been stolen. The group discovers that a Snivy has stolen the food. Ash attempts to capture it, attacking with Pikachu; though the Snivy (which is female) uses Attract, making Pikachu unable to fight her, and escapes. Ash sends out Pidove to track the Snivy down, just as Team Rocket. finds her instead. Jessie tries to capture her, but fails. Pidove finds the Snivy and signals Ash, who tries to use Oshawott and then later Tepig, but they are also hit by Attract. Ash eventually uses Pidove, who is unaffected by the Attract because it is also female, allowing Ash to finally capture Snivy and add her to his team. Ash and the gang are approached by a Darumaka, while another steals their lunch. Ash sends Oshawott to battle them, but it is defeated. Nurse Joy tells them that the Darumaka have been stealing food all over town. When the Darumaka steal from the Pokémon Center, Ash chases them. Meanwhile Team Rocket receives a briefcase from their contact. In a clocktower, Ash battles the Darumaka, and they point the group to Darmanitan in Zen Mode to prevent one of the bells from falling down. Ash and Cilan make a new hook to hang the bell, and Darmanitan helps them attach it with its psychic powers, before taking itself out of Zen Mode to finally fix the clocktower's bell. Episode 9- The Bloom Is on Axew! Episode 10-A Rival Battle for Club Champ! Ash, Iris, and Cilan meet up with Trip once again on the way to Nacrene City, after they stop by a Battle Club owned by another Don George. There, Ash challenges Trip to a 5-on-5 battle. Ash's Oshawott and Tepig are easily defeated by Trip's new Tranquill, and Pikachu manages to finish the job off. Trip's newly-evolved Servine emerges, still able to beat Pikachu. Ash's female Snivy takes advantage of the gender differences, and manages to use a combo of Attract, Vine Whip, Leaf Storm, and Leaf Blade to finish off the Pokémon. Frillish is then sent out, beating Pidove quickly. Ash loses the battle due to the fact that Snivy keeps on attacking Frillish with the same moves over and over when its ability Cursed Body disables the moves and with a combination of Water Pulse's confusing effect and Hex, manages to take the win for Trip. Trip then tells Ash that Pikachu and Snivy are decent, but the others are "a joke". On their way to Nacrene City, the gang is harassed by a group of schoolchildren with the Garbage Pokémon Trubbish. They head to a nearby Pokémon Daycare and kindergarten, where they learn from the kids' teacher Miss Daniella that the kids found the Trubbish at the garbage dump and decided to bring it back to the school. However, Miss Daniella told them that the Trubbish could not stay and brought it back to the dump, only for the kids to bring it back and form a gang called the "Trubbish Squad" and barricade themselves in a treehouse rounded with a wall of trash. Ash goes up to the treehouse to convince them that the Trubbish has to go, but is attacked by the group yet befriends them as well. Elsewhere, Team Rocket is given a fake meteorite from Flint and are told that they will get more information later. Back at the school, the Sandile with sunglasses arrives and the children have Trubbish fight it. Miss Daniella then decides that she should battle the Trubbish Squad to determine whether or not Trubbish should stay. Ash challenges her, as he has joined the squad, and she sends out her Deerling to fight Pikachu. The fight causes the trash wall to collapse, almost crushes one of the kids and Trubbish; however, Ash, Miss Daniella, and the others save them by holding the wall back. After the fight, she decides that Trubbish can stay and everyone cleans up the school. Before Ash and his group leave, the owner of the Daycare gives Ash a Pokémon Egg. After being given a short tour of the Nacrene City Museum, Lenora accepts Ash's challenge, leading him, Cilan, Iris, and Hawes down into the gym's Arena. Lenora sends out her Lillipup, which Iris and Ash find cute, but Cilan reminds them that it is a Gym Battle. Ash sends out Tepig to fight Lillipup, but Lillipup uses Roar to send Tepig back and force Oshawott into the battle. Lenora then recalls Lillipup to send out Watchog, which uses its Mean Look to trap Oshawott in the fight. Oshawott holds his own in the fight for a while before Watchog separates Oshawott from his shell and uses Thunderbolt to defeat him. Ash sends Tepig out once more, and Lenora switches back to Lillipup, and her Lillipup uses Shadow Ball and Take Down to defeat Tepig. After the match, Ash is dejected until Don George tells him not to give up so easily, promising to teach Ash's Pokémon a new move. Meanwhile, Team Rocket infiltrates the museum and steals a meteorite, replacing it with the fake one they received earlier from Pierce. Ash trains with Tepig and Oshawott at the Nacrene City Battle Club, trying to teach them more powerful moves. After successfully teaching them Flame Charge and Aqua Jet, he challenges Lenora for the Basic Badge once more. However, Lenora's Lillipup has evolved into a Herdier since the last fight. Ash sends out Tepig against Herdier, once more, and he is able to hold his own against the powerful Pokémon until Herdier uses Roar to force Oshawott out again. Just like before, Lenora switches to Watchog and traps Oshawott with Mean Look. Oshawott uses Aqua Jet against Watchog, but misses, and is then struck by Confuse Ray. Confused, Oshawott is unable to attack and Watchog uses Thunderbolt, but Oshawott is now able to withstand the attack. He uses Aqua Jet, again, as Watchog uses Thunderbolt, once more, knocking out both of them. Lenora sends out Herdier again as Ash sends out Tepig. With the training from the Battle Club, Tepig is able to dodge Herdier's Shadow Ball attacks, until Lenora commands Herdier to use Giga Impact. Ash has Tepig use his Flame Charge, and after the two attacks collide, Tepig is the only one standing, winning the match. Lenora awards Ash the Basic Badge for defeating her, and after Ash heads to the Pokémon Center, he learns that the next Gym is in Castelia City. While on the way to Castelia City, Ash, Iris, and Cilan rest for a while when Axew notifies the others that the Pokémon Egg Ash got earlier is about to hatch. They remove it from the container. Iris tells Axew that he will "soon be a big brother". In his excitement, Axew accidentally knocks the egg down a hill, but Pikachu catches it before it hits a rock. It soon hatches into the Molting Pokémon Scraggy, and it Leers at Pikachu before trying a Headbutt and misses. Ash decides to help train Scraggy by having it fight his other Pokémon, but Scraggy keeps being rude and failing at various attacks against Pidove, Snivy, Tepig, and Oshawott, making Scraggy unsure of itself and not wanting to be kept in the Poké Ball. Elsewhere, Pierce directs Team Rocket to bring the meteorite they stole to a lab for study. During the night, Scraggy wanders off and is attacked by several Galvantula, leaving it Paralyzed. Iris and Axew gather herbs to heal it, and Axew finds the herb. The next morning, after Scraggy feels better once more, it wanders off into the forest to fight the Galvantula again, but with the others' help, Scraggy is saved. Later, after Scraggy gets in a fight with Iris's Axew, she and Ash decide that Scraggy should have a new fight, resulting in a draw after the two collide with each other and pass out. After Ash consoles Scraggy, Scraggy finally agrees to enter its Poké Ball. While on the way to Castelia City, Ash, Iris, and Cilan enter the Pinwheel Forest. As they walk through, Pikachu is attacked by a wild Sewaddle, the Sewing Pokémon. Ash decides to capture it, but it surrounds him with a String Shot attack and escapes. Deeper in the forest, the group comes across a large tree where they believe the Sewaddle is hiding. They climb up it and find a giant cocoon, only for it to be revealed to be Burgh, Castelia City's Gym Leader, who is in the forest to sketch some of the wildlife. As he shows the group his drawings, the Sewaddle attacks Ash again, only to nuzzle up to Burgh. It is soon discovered that Sewaddle likes everyone in the group except Ash. However, after Ash saves Sewaddle from a group of Woobat, Sewaddle begins to warm up to him. The next day, Sewaddle is abducted by a Patrat to reveal to the group that another Patrat has fallen ill, before Sewaddle attaches itself to a Deerling and falls in a ravine towards a waterfall. Ash dives in after it to save it, and is then saved by Burgh's Leavanny, Sewaddle's final form. Happy for being saved, Sewaddle allows Ash to capture it, and later the group parts ways with Burgh who tells Ash he will be waiting for him in Castelia City. On the way to Castelia City, Ash, Iris, and Cilan visit a mall where Ash finds that another Pokémon Connoisseur is testing the bond between Trainers and their Pokémon. Ash goes to see the Connoisseur, a woman named Burgundy, who falsely states that none of the Pokémon Ash has caught in Unova are compatible with him. When Cilan goes to check on Ash, Burgundy becomes angry, saying that when she brought her Oshawott to Cilan years ago he claimed that she and the Pokémon were not compatible. She also shows that she won the Trio Badge from Cilan's brothers, and challenges Cilan to a battle to fulfill its requirements. She first sends out her Dewott against Cilan's Dwebble, and Dwebble wins. She sends out a Sawsbuck next and Cilan sends out Pansage. In a fierce match, Pansage wins against the Season Pokémon, but Burgundy proclaims that one day she will be better than Cilan and leaves, with the rest of the group heading towards Castelia City once more. Ash, Iris, and Cilan finally arrive in Castelia City and meet Burgh, but they all discover that the city has shut itself down. When they investigate the sewers, they discover and assisst a Venipede stuck in a pipe, which, out of fear, Poisons Ash. Later, they see a whole swarm of Venipede in the sewers, which flood the streets. Trainers with Fire Pokémon do their best to fight the swarm, including Trip and his newly-captured Lampent. However, Ash tries to stop them from hurting the Venipede, as hurting them will not get rid of them. Professor Juniper studies the Venipede swarm back in Nuvema Town, realizing they must have been pushed out of their natural habitat by something. Burgh tries to figure out the problem in Castelia City when Trip continues to use Lampent to get rid of the Venipede, Ash getting hit by a Shadow Ball in the process. Nurse Joy arrives with her Audino calm down several of the Venipede, and the Venipede which they helped earlier came and helped to calm them. The rest of the group uses their Pokémon to gather the Venipede into Central Plaza to keep the townspeople and the Venipede safe. During this, Ash's Pidove evolves into a Tranquil, while Professor Juniper discovers that something is emitting energy in the Desert Resort just as Giovanni heads there to join up with Team Rocket. As the mayor thanks Burgh, Ash, Iris, Cilan, and Trip for helping, Professor Juniper flies in and tells everyone what is happening in the Desert Resort. Ash, Iris, and Cilan head out with her to the desert as Burgh promises he will let Ash challenge him for the Insect Badge when everything is cleared up.